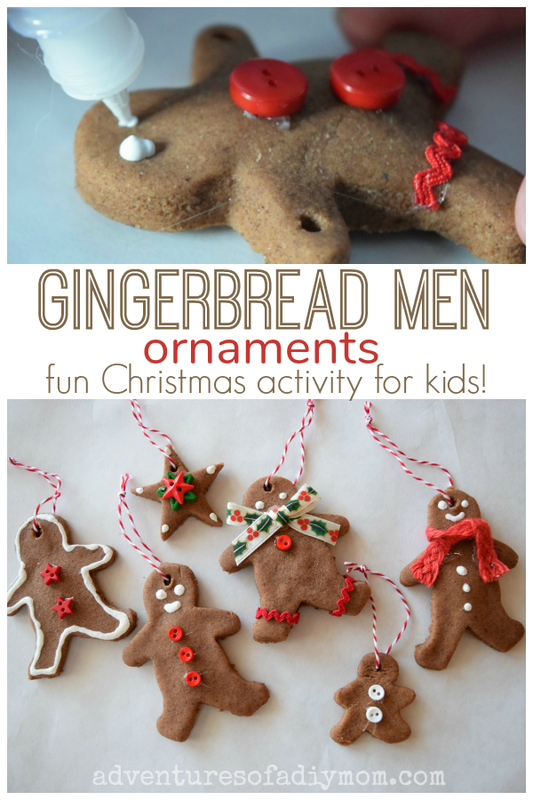 Create memories while making these gingerbread ornaments with your kids. 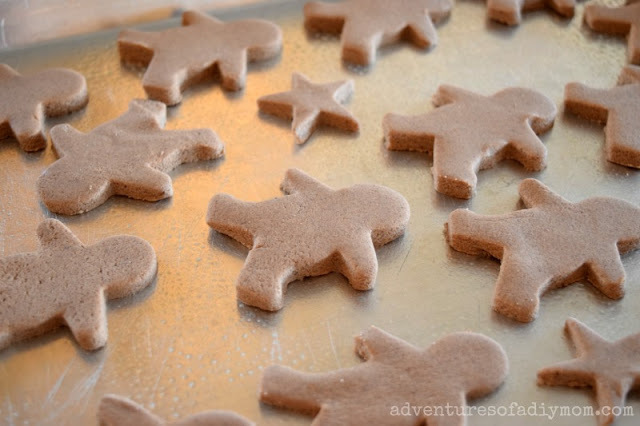 Made with cinnamon salt dough, they not only look like real gingerbread, they smell nice too. My kids love to make things and too often, I don't give them the opportunity. 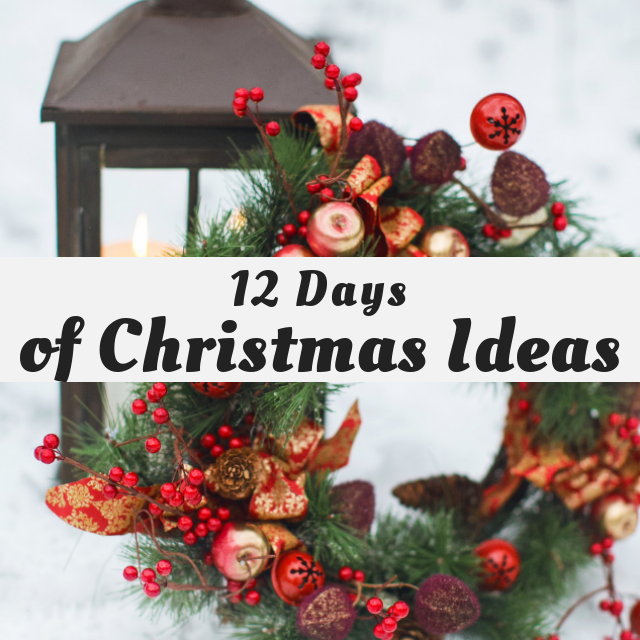 So I'm glad that there was a day specifically for kids Christmas crafts in our 12 Days of Christmas event. We decided to make gingerbread man ornaments from cinnamon salt dough. We have a tree with colored lights that we put up in the basement. It's dedicated to all the homemade ornaments that they've made over the years. It's bright and colorful. It's fun for the kids to dig through the box and find the things they made and the memories attached to them. These gingerbread men will be a fun addition. Begin by making the cinnamon salt dough. The recipe is at the bottom of the post. 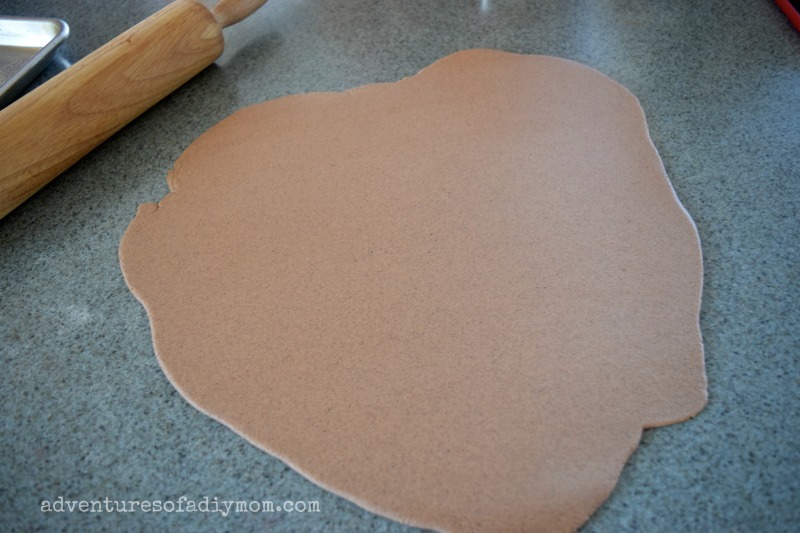 Roll out the dough to between 1/8 and 1/4 inch thick. TIP: The thinner the ornaments are, the flatter they stay. I noticed that the thicker they were the more rounded the tops were after baking. 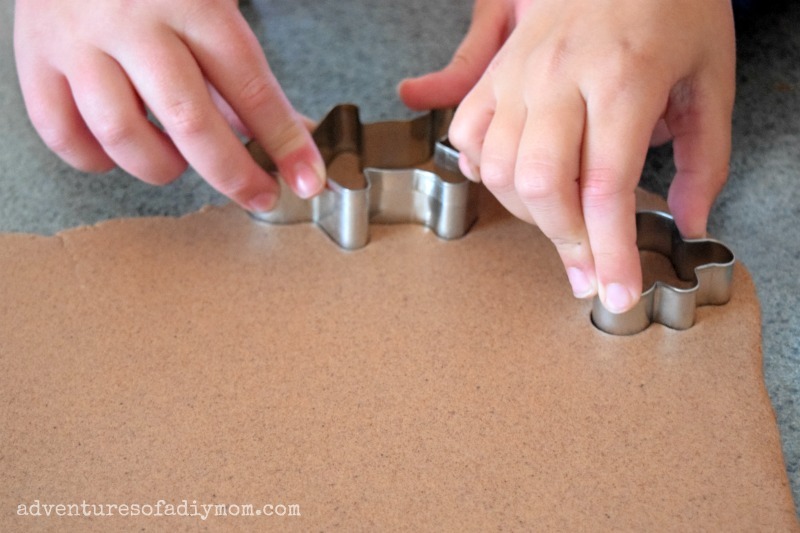 Using cookie cutters, cut out the gingerbread men. We also did some stars. 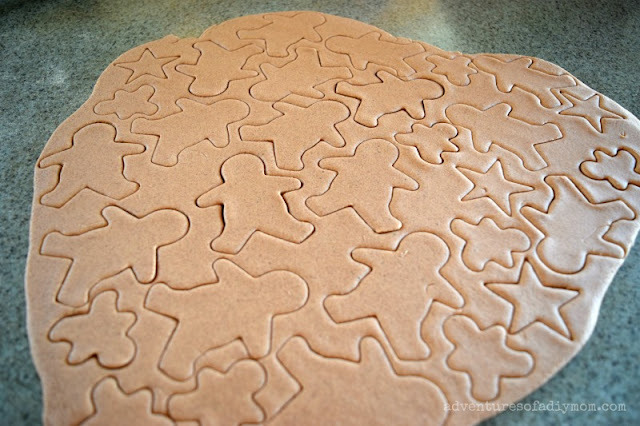 Once you have cut out as many as you can, remove the excess pieces and carefully transfer the gingerbread to a greased baking sheet. The dough stuck a little bit to the counter, so I used a flat spatula to help lift them off with out disfiguring them too badly. 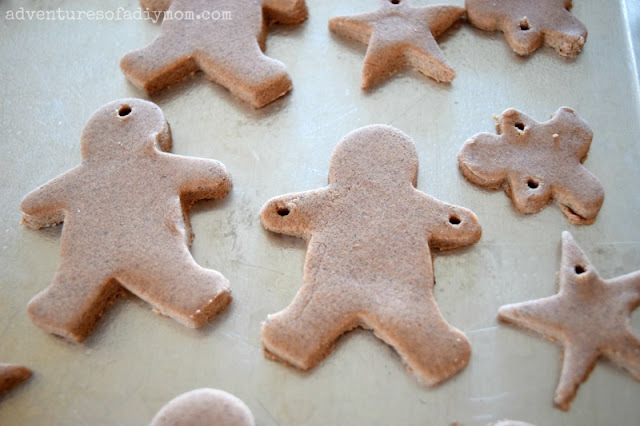 Combine all the scrap pieces of dough and roll it out again to make more gingerbread men. Don't forget to make holes in your men before baking. Once baked they are HARD and it will be too late. I used a toothpick. I poked a hole and then enlarged with a circular motion. I did some of the holes at the top to hang as ornaments. And some in the arms, to join together in a garland. TIP: Once they are all on the pan, spray them lightly with cooking spray. The reason for this is to keep the rich color. If you skip this step, the top layer of the ornament will look whitish, dried out and just weird. You don't need much cooking spray, just a light coat. Then bake them at 250 for two hours. Let cool completely. Now comes the fun part! Decorating the gingerbread men. 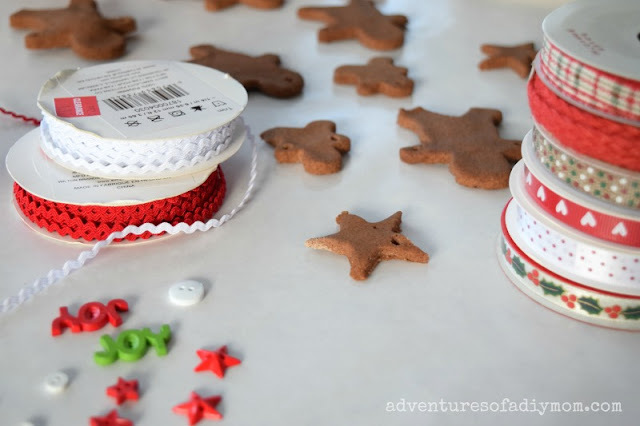 We gathered up some Christmas buttons and ribbon which we attached with hot glue. We used 3D paint for some of the details and twine to insert through the hole to hang. 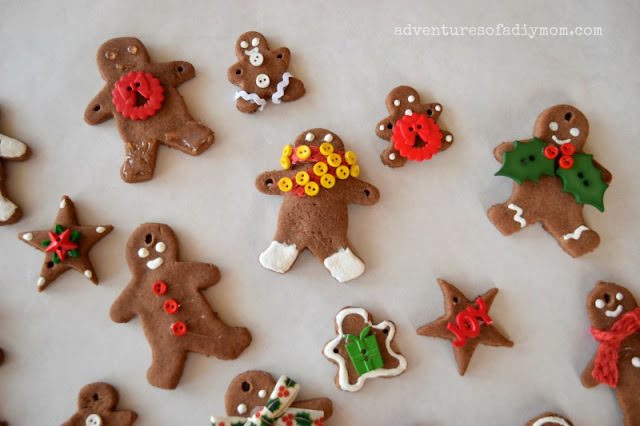 The kids had a blast making each gingerbread man their own. My Harry Potter obsessed 9 year old made Hermoine sporting a red and gold Gryffindor scarf. 2. Roll out dough and cut out shapes. Place on a greased baking sheet. 3. Use a straw or toothpick to make holes. 4. 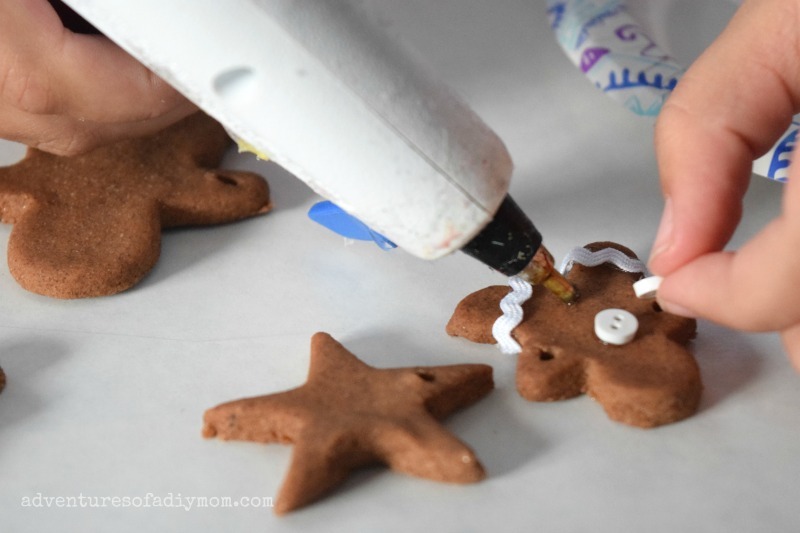 Spray lightly with cooking spray to retain a deep gingerbread color. 5. Bake at 250 for 2 hours. For very thin ornaments check after 1 hour. Very cute and I love that they are scented too! These are so cute & must make your home smell delicious too! 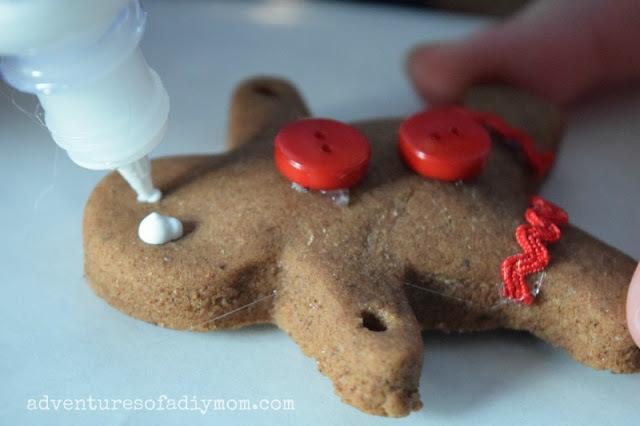 My kids would love making and decorating these gingerbread! Our kids loved making these when they were little! Thank you for sharing this recipe and idea. It looks like such a cool project. Cute! I may try this with my kids over Christmas break. What a great way to craft with the kids for Christmas and make your own ornaments. Thanks for sharing at Cooking and Crafting with J&J. I bet these smell delish and they are sooo cute!!! How fun that you have a special tree for handmade ornaments! 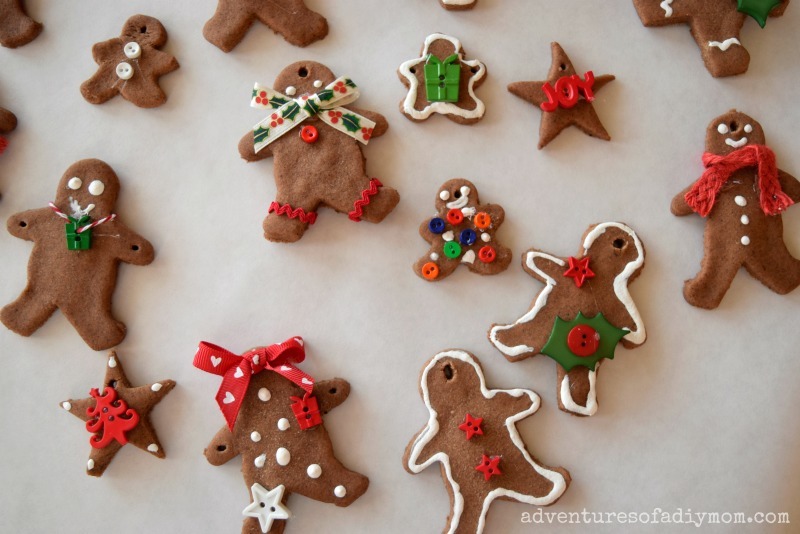 These are gingerbread ornaments are adorable and I bet so fun to make too. 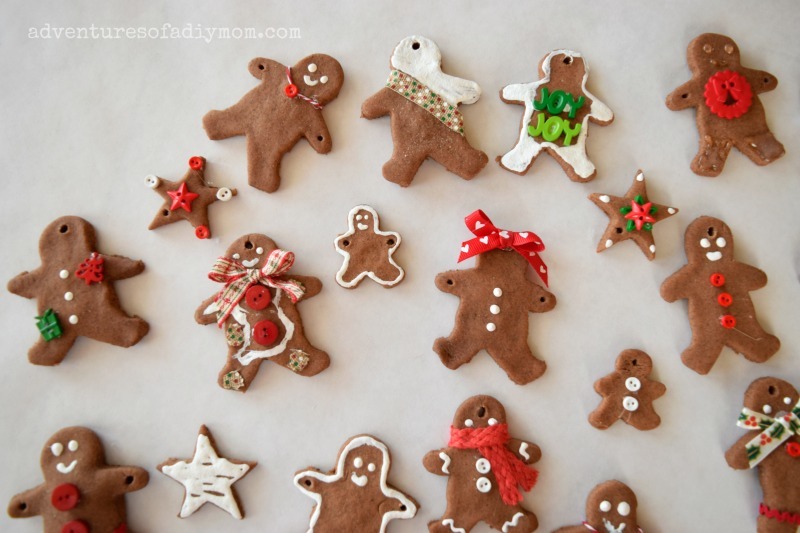 Your gingerbread men ornaments are adorable!! I need to make some for my tree and make my house smell good! !